If you are looking for information on the Mr Goodcents franchise business opportunity, Mr Goodcents franchises or Mr Goodcents franchising, then you have come to the right place. Think BIG! Join the Growth! Mr. Goodcents® is a quick service Subs and Pasta franchise that serves great food and exceptional service in a clean environment at reasonable prices. Offering a unique menu of huge sandwiches made with sliced to order meats and cheeses as well as pasta entrees for both lunch and dinner, Mr. Goodcents is Good Food That Makes Good Sense®. We are currently in 13 states and growing nationwide! 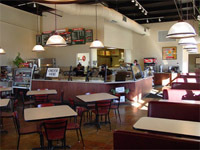 Site selection is an important element in the success of your Mr. Goodcents restaurant. Training and support are provided to help you pick a location. Shopping Center or strip centers providing sites with 1,500 to 2,400 square feet of space are typical Mr. Goodcents locations. The ideal space is usually between 1,600 and 1,800 square feet. We will support you with information and tips to help you negotiate the best deal possible. Support is provided through prototype floor plans and approved equipment packages by national suppliers. Thirty day minumum training covers all aspects of job operations and administration, as well as field training. Approved National Suppliers - All Mr. Goodcents® products are approved by Mr. Goodcents Franchise Systems, Inc. and are available for distribution in most major metropolitan areas. Quality control and test panels are utilized in continuing research for quality products of the highest standard.